Anyone who wants to host a meal at Second Baptist must first contact the church office with 6-8 weeks advance notice. Each event requires a Point Person. EXPECTATIONS: The role of the Food Ministries Coordinator is to help your group put on a meal. 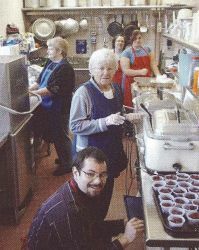 The Coordinator does not necessarily cook the meal but prefers to teach others how to use the kitchen, create menus, draw up shopping lists, and help determine how many volunteers you will need to recruit for shopping, setting up, cooking, serving, dish washing, and cleaning up. Each event is different and requires different arrangements. PLEASE have your Point Person contact Ronnie as soon as possible. QUESTIONS: You will need to decide on the purpose of your meal. Will it be for fellowship, fund raising, supporting a ministry or just a meal? If it is supporting a particular ministry, please let everyone know that through church communications (see below). Next, who is going to pay for the meal? How many people do you expect to feed? What will it cost to prepare the meal? What will you charge? What do you hope the profit will be? CALENDAR: After you confirm details with the Food Ministries Coordinator, you must contact the church office as soon as possible to check the church calendar and arrange for promotion. You may need to fill out a building use form, so give yourself time. PROMOTION: Event promotion is also your responsibility, and we will help you with this. Our Office Manager, Evelyne Battle, expects the Point Person to provide timely submissions to the weekly Crier bulletin insert (deadline is Tuesday) and the Crier Newsletter (Deadline is the 15th of the month). She is in the office Monday, Tuesday, Wednesday and Friday from 9 am to 2 pm and the phone number is 860-668-1661 or e-mail office@SecondBaptistSuffield.org - Please remember that the average person needs to receive information 6 to 13 times in different ways before it really sinks in. SIGNS: If this is a public meal, the office can send out post cards to our special public supper list (needs to be done one month in advance). Do you need signs put up around the church? The large sign out in front of the church needs to be erected two weeks in advance. Contact Win Senter for this at 860-916-0278. NEWSPAPER: If you would like the local newspaper to cover your event, The Observer deadline is the 15th of each month. Press release forms are available in the rack outside the church office door. The office can assist you with this. If you would like a reporter to do a story on your event or ministry, please call the church office as soon as possible. Remember, "A picture is worth a thousand words." WORSHIP ANNOUNCEMENTS: If you would like the Pastor to push your event during worship announcements, please be in touch with details by the Wednesday before worship. CALENDAR: After you confirm details, you must contact the office as soon as possible to check the church calendar and arrange for promotion. You may need to fill out a building use form, so give yourself time. PROMOTION: Event promotion is also your responsibility, and we will help you with this. Our Office Manager expects the Point Person to provide timely submissions to the weekly Crier bulletin insert (deadline is Tuesday) and the Crier Newsletter (Deadline is the 15th of the month). She is in the office Monday, through Friday from 9 am to 1 pm and the phone number is 860-668-1661 or - Please remember that the average person needs to receive information 6 to 13 times in different ways before it really sinks in. SIGNS: If this is a public meal, the office can send out post cards to our special public supper list (needs to be done one month in advance). Do you need signs put up around the church? The large sign out in front of the church needs to be erected two weeks in advance.